Ran down to LA Barbecue this morning, well before they opened, to chat with John Lewis for a minute and see how things are going in his new post as pit boss at the joint where he was an apprentice just a few short weeks ago. 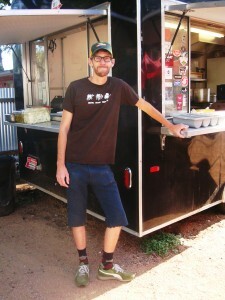 Lewis was excited to be getting his recipes and techniques dialed in at the food trailer where he was thrust into the spotlight by his mentor; John Mueller’s abrupt departure. The young barbecue cook showed me some modifications he’s done to the smoker to improve its performance i.e let it breathe better, and he reports that significant gains have been made in the efficiency of the enormous iron beast. In spite of already being at the top of the brisket heap in Austin, Lewis explained to me that he’s still working on the process to get that caramelized crackling crust that all top flight barbecue joints shoot for. The sign of a good cook is that he’s always trying to figure out how to improve his game. On a recent visit Lewis’ brisket was already very good, but it was his scratch hot guts sausage that really impressed. I could be wrong, but I believe he’s the only pit boss in town taking the time to make his sausage from scratch. Speaks volumes. LA Barbecue’s doing land office business in South Austin. When I drove by the trailer a couple hours after Lewis and I spoke, the line was almost to the street. It’ll be interesting to see how their barbecue evolves as time passes by and Lewis begins to put his signature on the food. These are exciting times in the world of Central Texas barbecue and watching the evolution of men like Lewis makes it that much more intriguing. This entry was posted in Texas Barbecue, Texas Barbecue Photos and tagged Austin, barbecue, BBQ, Brisket, hot guts, jmueller bbq, john lewis, john mueller, la barbecue, leann mueller, texas. Bookmark the permalink.